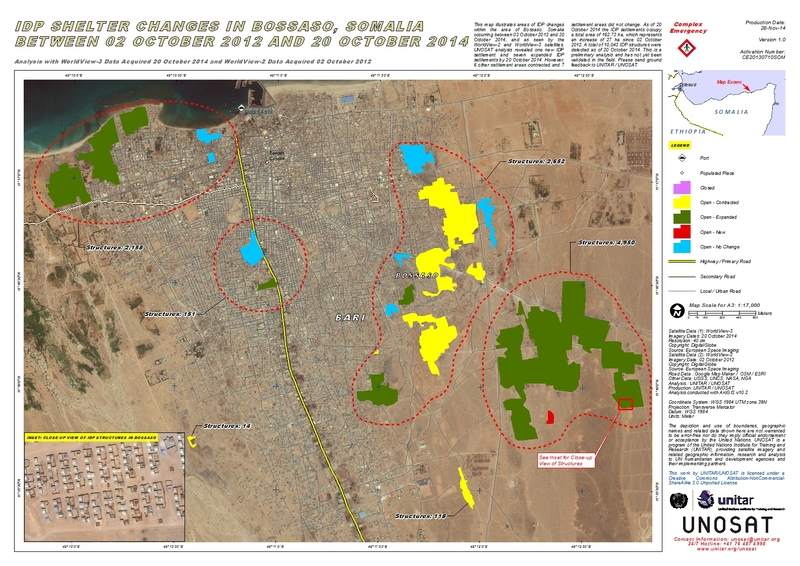 This map illustrates areas of IDP changes within the area of Bossaso, Somalia occurring between 02 October 2012 and 20 October 2014, and as seen by the WorldView-2 and WorldView-3 satellites. UNOSAT analysis revealed one new IDP settlement and seven expanded IDP settlements by 20 October 2014. However, 6 other settlement areas contracted and 7 settlement areas did not change. As of 20 October 2014 the IDP settlements occupy a total area of 162.73 ha, which represents an increase of 27 ha since 02 October 2012. A total of 10,043 IDP structures were detected as of 20 October 2014. This is a preliminary analysis and has not yet been validated in the field. Please send ground feedback to UNITAR / UNOSAT.